This might be good news for those who lost their lust of life after the passing-away of Italy’s finest Nocratai, for the band might have reformed recently! All together: hurray! Yet beware: I am not sure, to be honest, whether the members did join forces once again, for the stuff on this new album is not exactly newly written material. And the fact that there was a compilation being released in 2017 (consisting of two older demos), does not necessarily suggest a reformation. Anyway, there is some previously unreleased stuff available right now, so as said, all together: hurray! No, seriously (for a while). 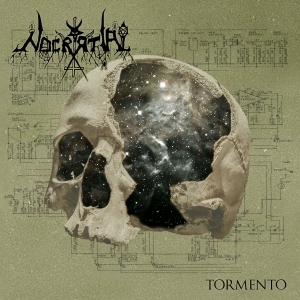 Nocratai were quite an active and productive band in between 1999 and 2008, with two hands full of demonstrational recordings and a couple of splits; the latter with e.g. Kaprogöat or Via Dolorosa. In 2009 the band split up, yet behind the screen, there was some activity going on, apparently. The members were still working together, and in some way, they created the basement for material that would, eventually, see the unlight once more in an unknown future. Well, that future is now! Davide ‘Beast’ Gorrini (strings and programming; also known from his involvement with Frostmoon Eclipse, Deathrow and, since recently, Manetheren), 4 (voices, noises and sampling; he was the guy behind Rant666), additional sample-provider Nekromantik, and one of Italy’s most famous / notorious multi-instrumentalists, being Gionata ‘Thorns’ Potenti (think: Acherontas, Blut Aus Nord, Moloch, Frostmoon Eclipse, Deathrow and tens of others), recorded some more material at the very beginning on this decade, and this got released very recently via the triumvirate of Ukraine-based GrimmDistribution (owned by Satanath Records’ Aleksey), The Ritual Productions from the Netherlands, and Black Metal Records from Indiana, U.S.Aargh. There are (were) 500 copies, coming with an eight-page booklet in a ‘regular’ jewel-case edition. The drum programming and the many samples give that industrialised attitude in the first place. The structure of the rhythm is quite mechanic in execution, adding that electronic / techno’ish thing, while several noises and sounds (like the many intermezzi, as passages to the next composition, often with those spoken samples) strengthen the industro-machinal approach. And you know, that Electro / Techno part of the game fits to the other side, the blackened Metal essence. It actually has something uncomfortable, and hey, isn’t that an expression of the Black Metal spirit? Indeed it is! The ‘Metal’ side is technical and sort of melodic in a groovy way. Do not expect fast fingerspitzen guitar play with an overload on leads and solos, but a basement of monolithic harshness, like a wall of guitar sounds. The sound is extremely overwhelming and powerful, and therefor the monotone performance hammers and smashes, almost militant / militaristic to the core.